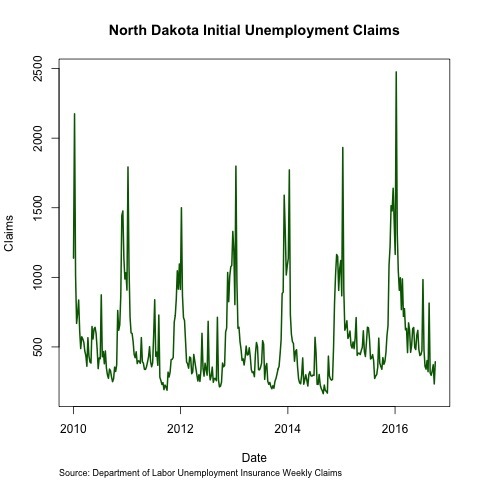 The discussion surrounding the oil boom and broader performance in the North Dakota economy tends to focus on variables such as employment, unemployment, and labor force. Nothing wrong with that really; these three measures provide important insights into labor markets and, at least indirectly, broader economic performance. 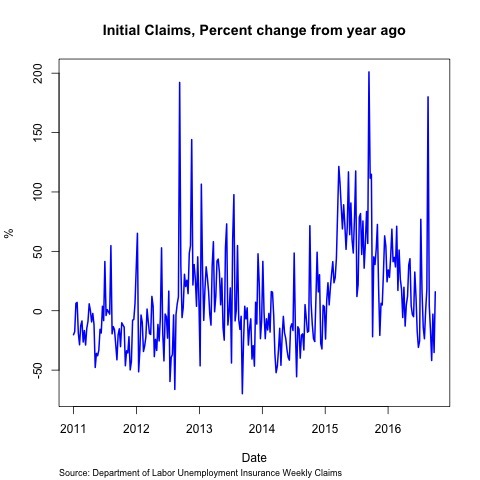 There is a different measure, available with a much higher frequency and likely more useful to the broader discussions of economic performance: unemployment insurance claims. A couple of things stand out in the graph. First, the level data display a clear seasonal trend. I will take care of removing the seasonal trend later. These are weekly claims, so there are definitely higher frequency and a better lag time compared to other measures. Looking just at the peaks, which occur in winter months for North Dakota (I doubt that surprises anybody), we can see a clear upward movement from 2014 to 2106. What is surprising, to me at least, is that the claims are not higher with the large fall off due to the peak, and bust, in oil economy and related employment. There is an increase, but not a drastic spike in claims. I mentioned seasonality, and the need to remove it. I look at the percentage change from year ago levels to control for seasonal fluctuations to see what these percentage changes look like. As a technical note I removed one observation from the 2011 data. There was an extra observation that year given the way the calendar fell and so I just removed it since there were no other 53rd weeks in the other years for comparison. Clearly the seasonal pattern is now removed from the data and we get a bit better sense of where the real spikes occur and there are a few. Late 2015 saw a significant spike, as has summer of 2016. There is also a clearer increase in unemployment claims, although some of this is surely due to the lower base of claims compared to other states. Again, the oil economy decline represents an issue for the state, and the data speak to that problem, but also give us a sense that the scale is not necessarily at the disastrous levels indicated at times. Obviously this is also statewide data and does not rule out more severe issues in various regions within the state.